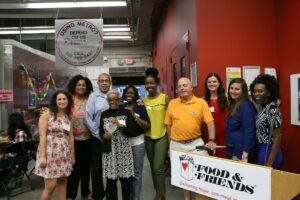 Food & Friends » Celebrating our Volunteers and “Above and Beyond” Volunteer Award Winner, Johnny Pitchford! Home > About Us > Celebrating our Volunteers and “Above and Beyond” Volunteer Award Winner, Johnny Pitchford! 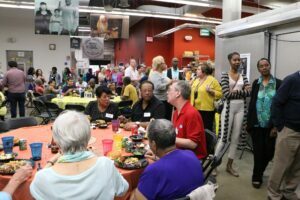 Volunteers gather for food and fun at Annual Volunteer Appreciation Dinner. Every day we witness amazing volunteers throughout every facet of Food & Friends. With over 9,000 volunteers each year, we are overwhelmed by their spirits of caring and community. Each year we celebrate our volunteers at our Annual Volunteer Appreciation Dinner and Awards. St. Augustine Catholic Church honored for 20 years of delivery service. It is always a joyous and festive evening, and this year was no different. We celebrated volunteers with five, ten, 15, and even 20 years of service! And we honored the stand out delivery group from St. Augustine Catholic Church, which has been delivering meals for 20 years. This dedication to the mission of Food & Friends on the part of our volunteers is truly awe-inspiring and we are incredibly grateful. 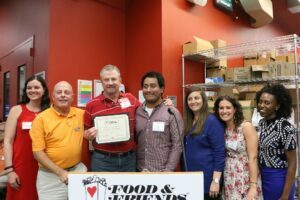 But the recipient of Food & Friends’ 2017 Above and Beyond Volunteer Award truly stands out for the extra time and effort he puts in to make Food & Friends and our community a better place. Johnny Pitchford is a well-known face all across the organization. He is a regular administrative volunteer in the Development Department at Food & Friends – helping to send out mailings, make copies, and helping to keep the entire department organized. You will also find him in the kitchen, peeling potatoes, chopping vegetables, and having great conversations with the other volunteers and chefs, who truly appreciate his kind spirit. And most recently, Johnny put on a new hat – being the first volunteer to sign up for our new delivery jumper program, riding along with our staff drivers to lend an extra set of hands on the delivery route. And even with all of these activities, he still finds the time to do so much more. You may see Johnny helping out at a number of our events throughout the year – providing support during Chef’s Best, distributing pies for Slice of Life, or hosting at a restaurant for Dining Out for Life. What you may not see is all the work that he has put in to prepare for each these events – offering to stay until 8pm or even later some nights to help make sure our events are a success. But perhaps most inspiring is that Johnny is always willing to do more, even after all the late nights and practically living in our building for days at a time. And even though he is now a full time resident of Rehoboth Beach, Delaware, he makes the several hour trip (both ways) up to DC so often that you would think he lives right across the street. The staff here at Food & Friends admire and thank Johnny for his dedication to Food & Friends and for all of the time and effort he is willing to give for our neighbors who have nowhere else to turn – and we always look forward to seeing him around the building. It was our great honor to have awarded the 2017 Above and Beyond Volunteer Award to our friend and dedicated volunteer, Johnny Pitchford, and to celebrate each and every volunteer who passes through our doors. Thank you!